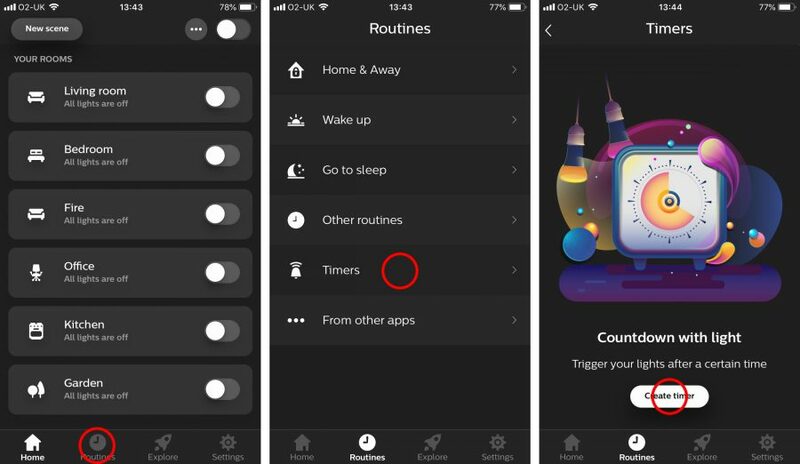 Through the Hue app you can set up timers to turn your lights off, to a different color or even blink them. Think of it as a visual alarm. Tell the kids they have 10 minutes before bed, set a timer and have the lights in their room blink when it is bed time. Or perhaps you have something cooking while you are watching a film, as a reminder your lights could start blinking in the living room where you are watching a film to remind you to pause and go and turn off or check your food. Timers a re a great way to act as a visual alarm, and also if you are hard of hearing a great alternative to your typical audio alarm. In our example below we set a 15 minute timer to go to nightlight mode so I know it is timer to stop reading and go to bed. Setting a timer with Hue is very quick and easy, it is broken down into steps below. You can elect the scene or recipe for the lights, as well as the last state. You timer will automatically start, you can stop and start this at anytime, your timer will be saved here and others can be set up if you wish. 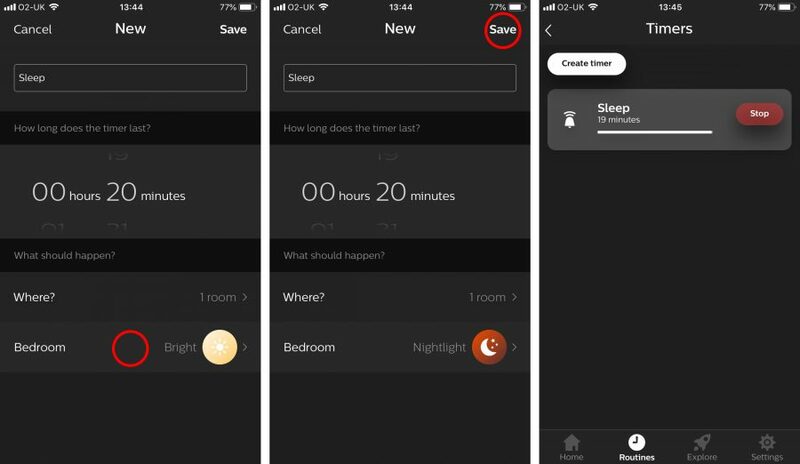 Below are images that show the steps for the latest version of the Hue app. How are you using your timer? Let us know below in the comments. Are your bulbs and bridge all up to date, as well as your Hue app? How to, if I want to set up a timer for my bulb, that’s allways switch off after 5 min., everytime it is switched on. I need that to save energy. The bulb will be switched on by clicking a “on” on a dimmer switch. If my outdoor lamp should be on, 5 minutes after I turned it on. How to?